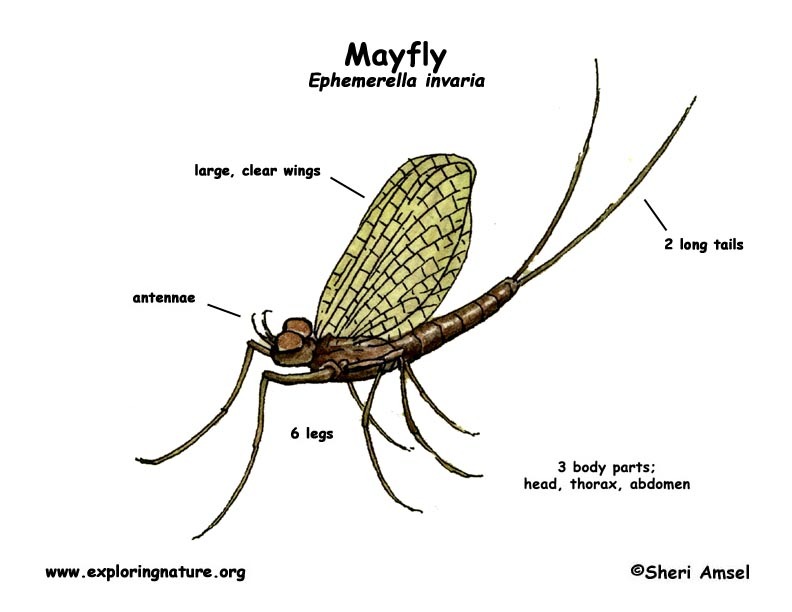 There are more than 700 species of mayfly in North America. They are found all over North America. They live in and over clean lakes and rivers. There can be many sizes. They are usually reddish-brown with large, clear wings. The wings have lines in them. They have 2 long tails. 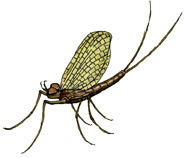 Adult mayflies dance above water, mate, lay eggs and die in just a few hours. The young phase nymphs live for 2-3 years. They only eat when they are in their young phase (nymph) in the water. Adults have no mouthparts for feeding at all. Adults swarm over the water and then mate. Females lay eggs while they fly low over the water or they actually go under the water to lay eggs on water plants. The eggs hatch and young phase mayflies (larvae or nymphs) live in the water and eat algae and whatever settles to the bottom of the water.